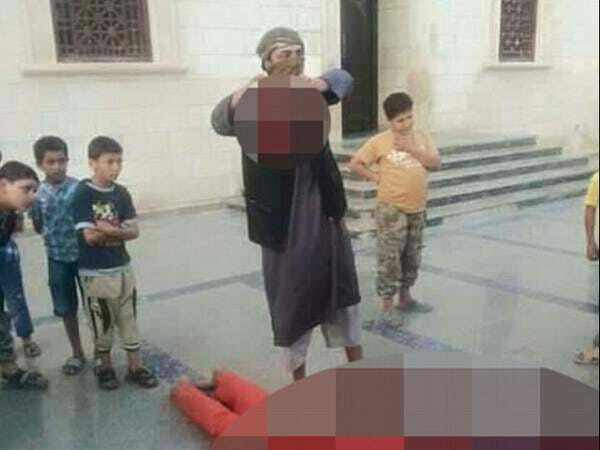 ISIS fighters took a group of six year-old children to a public beheading in Libya recently. The “apostate” was a captured postal worker. Then they displayed the head on a stick. The Isis militant group executed a captive postal worker and displayed his head before a group of children as young as six. Images shared by supporters of Isis in Libya showed a man in an orange jumpsuit being led out and murdered by masked executioners. The captive, identified by the Libyan Herald as army volunteer Abdulnabi al-Shargawi, was reportedly captured while manning a government checkpoint at Ras al Helal and convicted by an Isis court of “apostasy”.